She's been on the news paper twice. 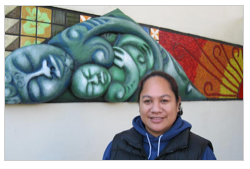 She is cool because she takes me to KAPA HAKA at Tamaki College. My mum also takes me out to watch performances for Tamaki College which a awesome. My mum is amazing and I'm happy to have her. yes your mum is cool. Because remember when she helped us on Matariki.? When we made the stars with her.? They were so cool. And can you please thank your mum and your aunty for helping us.? kia ora Reina your mum is a very good person. She was very cool and funny at camp. I have to say she's great because she always participates in what our school does like trips and camps.